E-pistle 2007/050 – Paxarete, the unloved saviour of sherry casks? Where are those differences coming from? Why is the present day sherry profile so different? Is there a chance we could return to that much loved sherry profile from 30 or 40 years ago? Before we continue I try to explain in a nutshell the being of Sherry and the different styles that are found. It all starts with wine from the Palomino grape grown in the production zone of Jerez. Other grape varieties as Pedro Ximénez (or PX) and Moscatel are used for sweetening or blending purposes. When fermented juice of the Palomino grape is put in casks. A mouldy layer, called Flor, emerges. After spending around five years under the protective Flor layer from oxidation in a complex racking system, called Solera, it’s ready for bottling under the name Fino (when the grapes are grown in the area around Jerez de la Frontera) or Manzanilla (when the grapes have grown the area around Sancular de Barrameda) and has a light nutty/fruity style for Fino or a even lighter, acidic/mineral style for Manzanilla. When this wine is further matured and the Flor layer starts to disappear it will turn into an Amontillado, which is rich and more alcoholic. Sometimes the Flor does not (fully) emerge. This happens when the grapes are pressed to heavy and to many tannins from the grapes are released and/or the cask is releasing to many tannins. The wines oxidises and develop into the dark, heavy styled Oloroso. Another type is Palo Cortado, in taste a cross-over between Amontillado and Oloroso but it’s quite rare and of no interest for this e-pistle. It’s the Oloroso casks we want to mature spirit in, as those will give colour and taste. A Fino casks is much more subtle and less appreciated. Everyone who has tasted a Fino cask matured whisky at younger age will know what I mean. Although far from complete this must give you enough (ultra) basic information about Sherry. Now we can continue. When asked why sherry wood was so much better those days the most heard answer will be along the lines of “Sherry consumption was much higher those days, so there were more casks available” to “By law Sherry has to be bottled when exported, so there’re no ‘wet’ casks outside Spain anymore and thus the quality has dropped“. These two remarks are very general and need some more refinement. It’s true consumption was higher but that applies mostly to sweet sherry (i.e. Oloroso or the sweetened Oloroso known as Amoroso or Cream). For the second line: It seems I fail to find any information about that law… What I can find is a law from 1978 stating Sherry has to be matured in the Jerez area and a policy since the same year encouraging producers to bottle in Spain. For example: in 1985 46% of the total export of Sherry was in bulk ! Sadly I don’t know if ‘bulk’ means in casks, containers or tanks. It seems we can combine the two separate lines into one: There is a shortage of (Oloroso) casks outside Spain due to the fact all the (Oloroso) Solera’s have to be situated in Jerez. Let’s return to my first refinement “the surge in consumption applies mostly to sweet sherry“. This, sadly, is something that we can’t change, unless we decide not to be afraid for intense and heavy style tastes anymore. The producers concentrate on Fino and Manzanilla of which the sales have exploded since the popularity of Tapas since the late 1990’s. There is a bright side to this story. In a attempt to put the wines of Jerez on the map again most producers changed their portfolio. 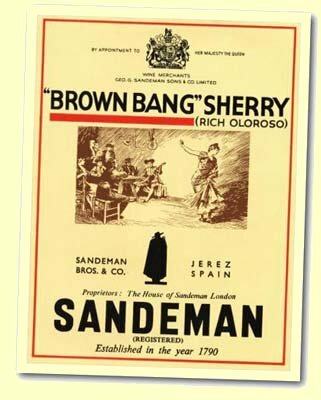 With the sickening Medium Dry Sherries out of the public’s grace producers saw their old Solera’s of Amontillado and Oloroso used for sweetening and giving character to young wines being useless. Few decided to bottle small amounts of those old Solera’s. They did that with huge success! Since the mid 1980’s most sherry houses concentrate on two things: the production of light sherry and the sales of old Solera wines. Things get even better when the Consejo Regulador advised to give age statements on the labels. Instead of staring at a bottle of Barbadillo Obispo Gascon Palo Cortado people BUY a bottle of Barbadillo 30 years old Palo Cortado (which is exactly the same). All guaranteed by the ‘Vinum Optimum Rare Signatum’ or shortly ‘VORS’ seal. Sales have rocketed ever since. The production of sweet styled Sherries might be low, the flow of quality casks comming from the old Solera’s does exist. Sadly the flow of PX casks have come to an almost standstill. Some old Solera’s are released but the number is too low for sufficient use of casks in the whisky industry. For the second refinement it’s simple: I’m curious to know what way those beautiful casks were transported from London to Scotland. Not dismantled on a open lorry during a three day’s journey? Dismantled on an overnight’s journey by train? Remember the statements in London empty Sherry casks were considered ‘waste’ those days. I can’t imagine care was taken when transporting ‘waste-material’. In short I think we suffer from our romantic minds here. Back then the casks will have suffered from transport on land as they do now from transport by ship – and I’m dead sure the dismantled casks are surrounded with the greatest care possible… On this matter I say we have both, winners or losers. Up till now we’ve dealt with availability and transportation to Scotland of sherry casks. For myself I can’t find an answer why the profiles are so different. There must be more. At least we’ve got one reason for the differences in taste. Now let’s try for the profile! When I study my notes on sherried whiskies and try to condense them to just a few words the following can be read: ‘Spicy, clean yet slightly dirty’ or ‘Mellow, oily and slightly out of focus’. Two directions with one common divider: distilled before 1989 or after 1989. Let me urge to say there are loads of pre 1988 distilled sherried whiskies I don’t like as there are quite some post 1989 sherried whiskies I do like. Again, this is very general! Let’s continue; What happened around 1989? Quite right, by law the use of Paxarete became forbidden. Apart from a different style of vattings this is the only reason I can come up to explain the differences in ‘old Sherry’ and ‘new Sherry’. Paxarete comes from the Sherry region and it’s main component is cooked-in most (not fermented grape juice) which is dark because of caramelised sugars. There’re two kinds of cooked-in most. The first is Sancocho, where the most is cooked-in to about 30% of its original volume and has a sweetness of 32o to 33o Baumé (measurement of sugar). The second is Arrope where the original volume is down to 20% with a sweetness of 36o to 40o Baumé. To get Paxarete one part most and two parts of Sancocho or Arrope are mixed together. After fermentation it contains 8 to 9% alcohol and has a sweetness of 11o to 12o Baumé. Like Sherry it ages further in a Solera. A much more cheaper type exists by the name of Color remendado where the most is replaced by young wine and as far as I know is immediately used, so no further maturation takes place. Paxarete is/was a very important component of not only the colouring and blending of Sherry, it contributed to the general quality of Sherry as well. As the great book “Sherry” by fellow Dutchman Wim Mey has it: ‘Clearly contributing to distinction’. In the whisky industry Paxarete was used to, as they say themselves, “rejuvenate re-fill casks”. In a vacuum chamber it was blown into the casks. I can’t help this feeling I have first-fill casks saw this treatment also. Paxarete was also used for colouring and giving aroma. It’s not unthinkable different distilleries had their own variants on the above recipe and thus were able to create their own, as uniform as possible, sherry signature. This, of course within the limits of Paxarete itself. So it seems Paxarete was the forerunner of E150-A, the latter being much, much cheaper and thus favourable despite doing its job much, much worse. Here we go: I’ve got a dead feel the sherry signature we like some much in the old style whisky is for a huge part generated by: Paxarete. And to go on, not the shortage of oloroso casks or funny export, bottling or maturation laws has influenced the downfall of today’s sherry profile, it was the prohibition of: Paxarete. So, finally got that out my system! There’s a general consciousness the sherry profiles of the past were the better ones, so why bother with the fact it was partly due to an alien substance? I can imagine, as with E150-A, it’s difficult for some distilleries to admit the quality of their whisky depended partly of the use of something more than spirit, oak and time alone. Oh yes there is. As described above real Paxarete is a true natural, artisan product. It’s an art that is about to disappear and any loss of such artisan knowledge is a shame. Furthermore I can see no objections not to use Paxarete again these days where we tolerate the most alien kinds of new oak, Port pipes, casks that contained Marsala, Madeira, Champagne, Calvados, Cognac, Brandy, Claret, Sauternes, Burgundy, Tokaj, Pinot Noir, Chardonnay, Chenin Blanc etc, etc. Who knows what next – oh, I forgot to mention the herring cask experiment from Germany. One should realise that when we talk about the golden days of whisky, the 1950’s to the 1980’s, we talk about Paxarete as well. It’s as much part of the whisky tradition as direct fired stills, brewer’s yeast, worm tubs and under proof casks happily fading away in the warehouses. I leave you with a final thought: Demands for whisky are very high these days (some companies are already claiming to have difficulties meeting demands) and the markets of China/South-East Asia, India and Russia not even fully up, it isn’t difficult to see the industry will have huge difficulties maintaining whatever quality. Although producing reasonable quality spirit won’t be a major problem, new distilleries are being build and more will follow for sure, maturing the spirit is another story. And the latter is of growing concern to me. That is to say… I’m sure the spirit will mature but is the industry capable of delivering quality matured whisky? Maniac Pit already showed his concerns (E-Pistle 2007/001) about the actions the industry take to keep up with the demand for casks – and spirit. Bourbon to be sold at one year of age. (Tactical move to generate more casks, will last for about two or three years), more and more malts bottled at ages between 5 and 10 years (Another tactical move which will last for the same amount of years). Turning to much younger and thus less suitable oak. In all, it’s a kind of damage control but they are not the solutions we are looking for, the problems will return. The Paxarete used should be of highest quality comming from Jerez. Think of it, it’s traditionally linked to whisky, it has proven itself, it’s artisan, it’s biological and very important: we save parts of the oak forests by giving old casks truly a new life.